Tech Readers » Your Indigo Connection Can Be Your Ticket to the Cricket World Cup! April 23, 2019 3:34 pm You are here:Home Telecom Cellular Mobilink Your Indigo Connection Can Be Your Ticket to the Cricket World Cup! Your Indigo Connection Can Be Your Ticket to the Cricket World Cup! With all the cricket buzz in the air for the upcoming Cricket World Cup 2011, cricket fans all across the country are getting excited and pumped up to follow the matches and see which team take home the 2011 World Cup. 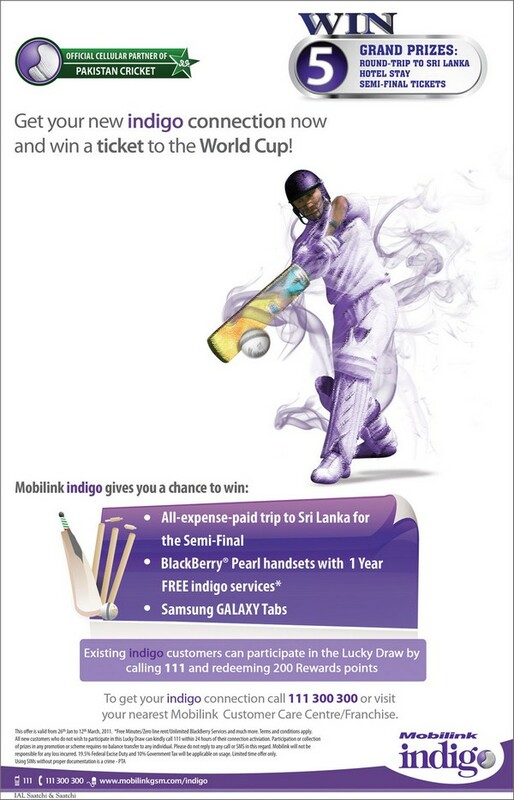 Understanding this passion for cricket shared by our valued customers, Mobilink indigo brings a thrilling new offer whereby all indigo customers can get a chance to win an all-expense paid trip to Sri Lanka to watch the World Cup Semi Final live! 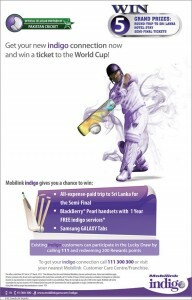 Mobilink indigo Lucky Draw will give away 5 Grand Prizes for Sri Lanka, as well as many other exhilarating prizes including BlackBerry® Pearl® handsets with 1 year free indigo services (including Free Minutes, Zero Line Rent, BlackBerry internet services, etc.) as well as Samsung Galaxy Tabs! So get ready to enjoy the World Cup like never before, only with Mobilink indigo! 2 Responses to "Your Indigo Connection Can Be Your Ticket to the Cricket World Cup!"